A group of medical students studies the afterlife by killing themselves and then resuscitating each other after a few minutes of flatlining. Once each person is back from their near-death experience, they learn that demons from their past have returned with them. "Flatliners" asks the ultimate unanswerable question, the one that has plagued mankind since we first became self-aware: is there anything else after death? People try to answer this question with logic, using philosophy, and with faith and religion, but it has yet to be answered. 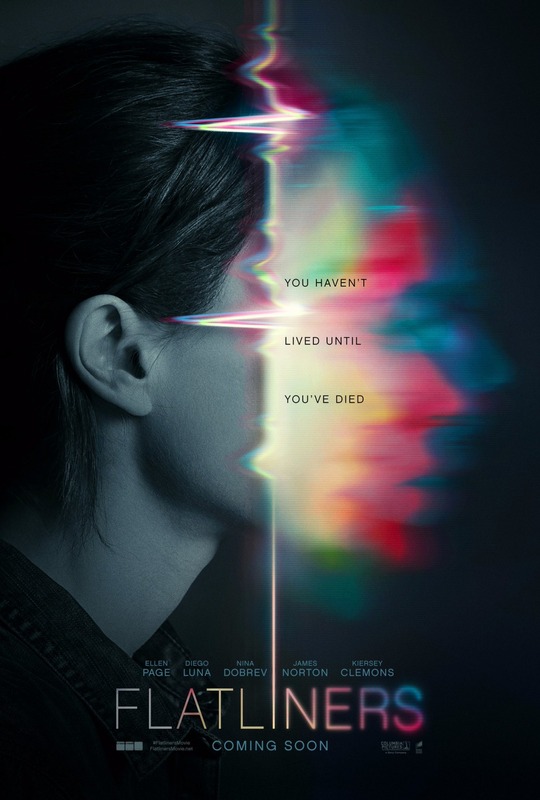 Courtney, played by Ellen Page, and her four fellow med students, played by James Norton, Kiersey Clemons, Nina Dobrev, and Diego Luna, plan to use science to give a definitive answer to the age-old question in the most obvious way possible: by dying, of course!! Despite what you may have heard, this is NOT, absolutely, positively 110% NOT a sequel, but a remake written by Ben Ripley based on Peter Filardi's original script and concept from 1990. In fact, it barely breaks away from the original concept/story at all. The only similarities kept from the original are some of the personality traits of the five main characters, which have been rearranged from person to person in order to be passed off as something new. While the concept is still an okay one, the question becomes: can director Niels Arden Oplev create a more compelling story than Joel Schumacher did? Can he make something truly interesting and engaging? Much like the experiment performed by the med students in this movie, not everything goes as smoothly as they had hoped. Prior to this film's release, the main piece of evidence that this was a sequel to the original 1990 "Flatliners" was Kiefer Sutherland's involvement. Why would he even be in this new version if he were playing an entirely different character? Well, thanks for nothing because that's EXACTLY what happens. Gone are the days when Nelson was in charge of the show. There is no mention of the original experiment done by his group in the 90's, nor are there any connections to the original movie. THIS IS A REMAKE, plain and simple. In fact, it's almost a beat-for-beat remake. Niels Arden Oplev brings absolutely nothing new to the table. In all seriousness, this time around, many of the elements of the plot have somehow been made even less interesting than they were the first time around. "Flatliners" is not just a failure compared to the original (which we only thought was "fine"), it's a failure as a movie, period. The narrative is not at all clean. Some of the things that happen in the course of the film's runtime directly contradict other plot points within the story. Unlike the original, the afterlife is not creatively designed, unique or original, or even enhanced by today's new technologies. When the med students flatline, their afterlife mostly consists of generic "out of body" experiences as they float out of the hospital over the city in some of the most basic, boring, uninspired drone footage we have ever seen. In 27 years, we'd like to think times have changed technologically, but none of our newly enhanced computer systems are put to use to make anything surreal or interesting. All of these sequences involve the most basic, least creative things they could have done. The longer the film goes on, the worse it gets, devolving into a by-the-book horror riddled with jump scares and ghostly figures going BANG! in the night. The script is absolutely atrocious, and the acting isn't much better. Save for Ellen Page, none of the actors feel like they a) fit in this movie, or b) want to be there at all. By far, the worst thing about this film is its dreadful pacing. There is nothing really driving the story, so it gets very tiresome and tedious very quickly. Though it is under two hours in length, it felt well over three. At least 30 minutes could have been cut from the final product and it wouldn't have made a damn bit of difference. "Flatliners" is a snoozefest, an absolute bore in every conceivable way. It's the most surface-level, generic, uninteresting movies we've seen in a while. It's obvious that way too many people collaborated on a movie that, at most, needed 3 people in charge of it. It's unimaginably dull, appallingly written, and poorly acted to boot.